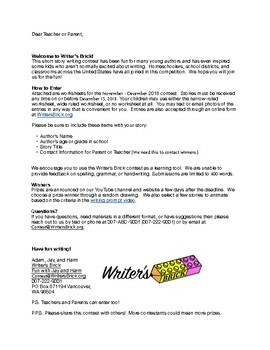 This unique contest includes a worksheet that students use to finish a short story writing prompt using their own creative writing skills. An animated version of the writing prompt is available at www.WritersBrick.org. Completed stories can be submitted by text, email, or Facebook for a chance to win prizes and a chance to have the student's story animated.